One of the truly frustrating things about writing this blog is to spend the time and effort carefully researching a story, only then to have the MSM doing the same story and getting it egregiously wrong – but getting all the attention and comment. So it is with The Daily Telegraph this morning, with its print edition splashing the headline pictured, the story replicated on-line, completely falling for the commission spin on the failings of the Met Office in triggering the no-fly restrictions in response to the Icelandic volcano eruption. Part of me – the unrealistic, hopeless optimist – says, surely people will read my blog and see that their story is crap. But the weary realist tells me that the MSM will prevail, crap and all. The error is already multiplying and soon will become a fixed part of the narrative. That is the way the world works. And this is not just a rant – if there is to be any accountability, getting it right is important. 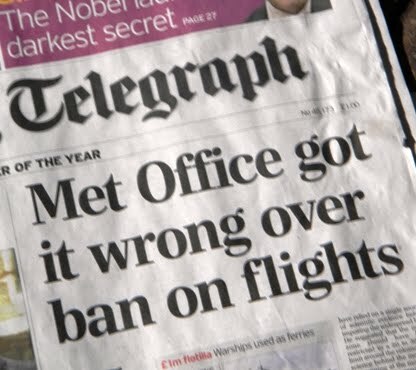 Pointing the finger at the Met Office for its role in the closure of British and European airspace is completely to miss the point. Far be it for me to defend the Met Office, but the use of models in this context is entirely appropriate. Where the fault lies is in developing a contingency plan which uses the forecast model to define the exclusion zone, without a requirement for refining a limited projection with real world data acquired from other sources, including and especially sampling from suitably equipped aircraft. The responsibility for this failure lies initially with the International Civil Aviation Authority (ICAO) – which is made up delegates from the member states, which puts the individual governments in the frame. Regional responsibility then rests with the EU commission and Eurocontrol, which turns the "guidance" from ICAO into mandatory requirements. Then final responsibility lies with the member state governments, for agreeing to rely on a flawed model, without making available the wherewithal to upgrade the model and provide the assets – i.e., sampling aircraft – to provide real time data to allow more accurate forecasts to be made. Therein lies the difference with the United States. Not only does it use a different model, which has provision for taking input from real time sampling data, but the US has the aviation assets which enables the projected area of the ash cloud to be sampled and a more realistic picture developed – upon which exclusion zones are based. However, the Met Office cannot be completely exonerated. Over term, it has chewed up over £250 million of public money on developing climate change models. It has spent only a fraction of that on ash dispersion models. As the authority of record, and the experts in the field, it could have pointed out to governments the inadequacies of its models, and the need for real-time sampling in the event of an incident. Thus, we have a multi-agency problem, with input from a wide range of actors and when – as here – the system goes belly-up, no one takes responsibility. Everybody blames everybody else. As always, the media takes the easy option. Instead of getting to the bottom of the issue, it picks on the easy target, leaving its readers ill-informed, and the guilty unpunished. Thus do we rant on our little blog ... ignored by the great and the good, who can and do turn to the MSM for their information. And we think the Shia Moslems are mad, when they indulge in self-flagellation. What is the difference, apart from the absence of physical wounds? Whatever happened to the internet? The beginnings of a recantation? The beginning of the end?